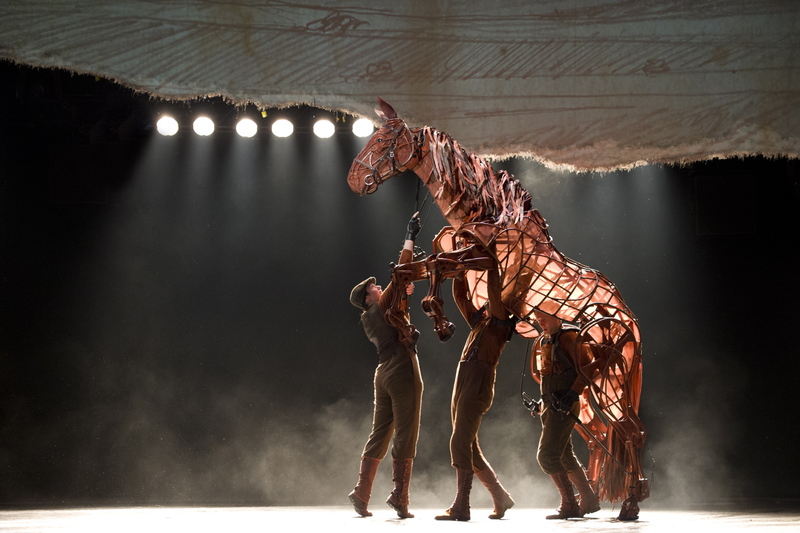 Exhilarating, inspirational and heart wrenching in equal measure, War Horse is that rare combination of epic story and cutting edge artistry that makes live theatre such a thrill. 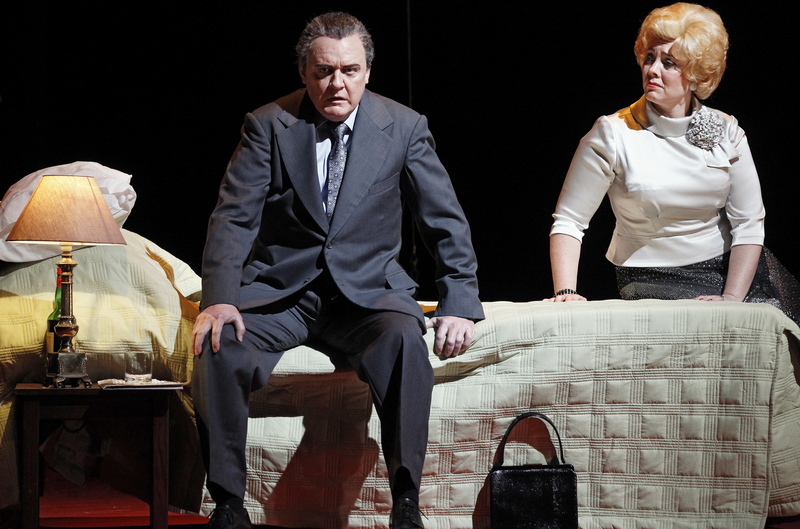 Arriving in sterling shape on opening night, the Australian staging looks sure to replicate the international success of the National Theatre of Great Britain’s acclaimed and beloved production. Foremost in advance publicity has been the use of puppets in the show, but this is far from a ‘puppet show.’ Gorgeous chestnut brown star Joey and his comrade black beauty Topthorn are each performed by a set of three puppeteers who work as one to achieve an incredible range of emotions. Through ticks and twitches, sounds and body language, the puppeteers convey the growth, fears and joys of the two horses. As spectacular as these puppets are to see in motion, their presence is wholly to serve the story, never to overpower it. The horses, along with a cantankerous goose and some vicious vultures, are all the ingenious creations of South Africa’s Handspring Theatre Company. Joey is first seen as a frisky foal, bought at auction by foolhardy Ted Narracott in a case of drunken one-upmanship with his brother Arthur. It’s love at first sight for Ted’s passionate son Albert, who raises Joey with all the love and affection he has to give. Separated when Ted sells Joey to be an officer’s horse, the hope-filled journey of boy and horse plays out against the devastation and cruel inhumanity of war. 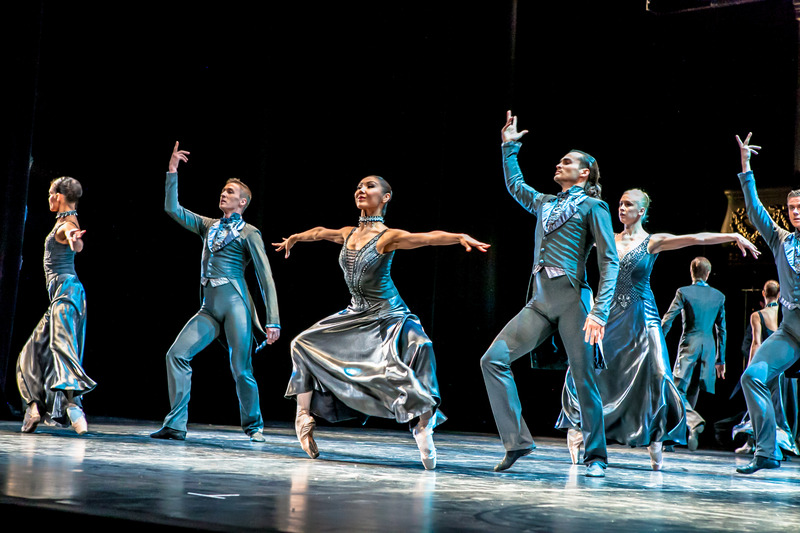 With the production values and cast size of a lavish musical, the production fills the massive stage of the State Theatre with ease. Proving herself a creative triple threat, designer Rae Smith has not only devised the realistic costumes and cleverly representative sets but has also created the highly evocative drawings projected on the back screen. The screen is presented as a torn shred from the sketchpad of Lieutenant James Nicholls, with the backdrops animated in a style that recreates live drawing by hand. A particular point that Smith makes with her work is man’s mimicry of horses in machinery. Cranes are seen bobbing and lifting like horses, and in a particular animal versus machine moment, Joey and an ominous black tank rear up at each other in the same way Joey and Topthorn had done earlier. The lighting design of Paule Constable allows magical entrances to be made from the inky blackness surrounding the stage, and the production flows forth with cinematic dissolves. The horror of war, notoriously difficult to convey on stage, is effectively achieved by the collaboration of sound, set and light designers to represent gunfire, bombs and explosions, as well as by the deadly impact on the characters of the story. One of Australian director Drew Barr’s many masterstrokes is the casting of a set of virtual unknowns. The authenticity and integrity achieved by this most un-commercial move are palpable. Almost every performer plays more than one role, each clearly delineated, and full company moments are extremely powerful. Nicholas Bell and Ian Bliss ground the adult cast as sparring brothers Arthur and Ted Narracott, with strong support from Dale March as Lieutenant Nicholls. From the large, evenly matched supporting cast, mention must be made of Lincoln Hall (so fabulous as the fey Franz in Rock of Ages) as the garrulous goose. As the headstrong Albert, newcomer Cody Fern delivers a star-making mainstage debut. Good looking and magnetic on stage and yet with an appealing accessible vulnerability, Fern seems cut from the same cloth as current rising star Eddie Redmayne. Taking Albert from petulant youth to devoted rider to mature-beyond-his-years soldier, Fern gives a wholly endearing performance, the first of many to come no doubt. 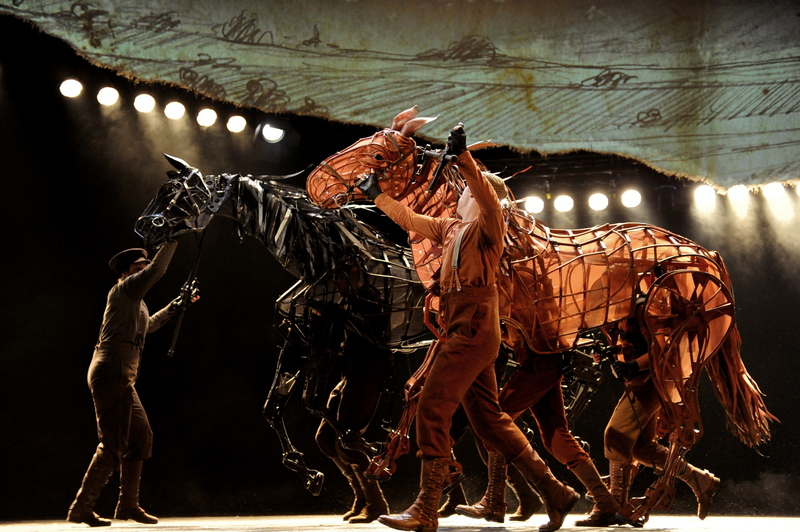 War Horse is event theatre that cannot be missed. War Horse plays at the State Theatre, Melbourne Arts Centre. The tour continues to Sydney, Brisbane and Auckland throughout 2013. You may also enjoy: Man in Chair’s Photo Preview of War Horse. Thanks for the insightful review Simon. My New Year’s resolution is to see this in London, it’s been on my “see it one day” list for too long. Oh Dominick, you definitely should see it. I don’t even live in London and I’ve seen it at the National and at the New London! Had a great chat with Chris Harper, Marketing Director of the National Theatre, at last night’s opening. Made me wish I was back in London. At least there is NT Live to keep me going in the meantime. War Horse has been playing at Vivian Baumont Theater (next to The Met) for a long time. Maybe > 1-1/2 years ? Anyway, what caused me to dismiss it is I thought the Spielberg movie was terrible. Did you see the movie ? Can you dislike the movie and like the show ? On The Met front, the new kids-oriented, abbreviated holiday version (if there can be such a thing as a kid oriented with Opera) of Barber of Saville, which was panned in the press, I say thumbs up. Also thumbs up to Maria Stuarda withElza van den Heever (The Queen) and Joyce DiDonato (Mary Stuart) screeching at each other back and forth for a relatively brisk just shy of two hours, excluding intermission. Matthew Polenzani was ill and Salvatore Cordella made his Met debut filling in as Earl of Leicester (who The Queen was hot for but he, alas, was hot for Mary. Perhaps if the Queen hit the gym more often this entire but of nastiness with cutting off people’s heads and all might have been avoided). Hi Siggy, thanks for your update. I also didn’t enjoy the Spielberg movie of War Horse. Some picturesque scenery but a bit dull and long otherwise. The play is brilliantly staged and is much more enjoyable than the film. Unfortunately, the NY season at the Vivian Beaumont closed last Sunday 6/1, otherwise I definitely would have recommended going to see it. Interesting that this version of Barber was panned, I will have to look up some reviews. I love the full length version that this is based – I recorded it on cable tv once and have watched it over and over. Bartlett Sher is a very clever director. The way he just used doors and orange trees was so simple and effective. And i presume they still had the giant anvil; coming down at the end of act one. The music is gorgeous in that one. I saw the Met’s kid oriented Hansel & Gretel in 2007 and I thought it would have been terrifying for children! I think they are showing Maris Stuarda in the cinema in a couple of months so I will have to see that one. Maybe the Queen will have got herself in better shape by then haha. Saw opening night of La Rodine. I bump it near the top of the season so far. Great looking set and costumes. Kristine Opolais debuted as Magna – I quite liked her. This is not Wagner. This is “light” if you like that sort of thing. Maybe a bit too close to “broadway” which I usually do not want in Opera but I liked this show. I have no idea what the story was about but I rarely do. No one died I know that so that was a nice change of pace. It was only the 29th time it has been performed at The Met. I have no idea why we need 1200+ Le Boheme and so few La Rodine. Maybe if they threw a horse into it people would like it more. I know The Met horse could probably use the work. Great choice! I love La Rondine, though I have never been lucky enough to see it live. All the elaborate stained glass and mosaic sets for this version are beautiful, as are all of Magda’s dresses! The opera was brought back to world attention due to the efforts of megastar married couple Angela Gheorghiu and Roberto Alagna (Alagna starred in Aida last month at the Met) The couple have since divorced, and Gheorghiu has seemingly fallen out of favour with the Met as she no longer performs there despite still being a big star in London/Europe. The Broadway influence you describe may be due to Puccini’s interest in The Merry Widow at the time he wrote La Rondine. No one dies, but a bittersweet ending for the tenor nonetheless. Know you have made me think about La Rondine again I think I will watch the dvd again tonight! Forgot to mention the only negative. But it’s not unique to La Rodine. The usual Met cacophony of people coughing and clearing their throats. Do they do this in Melbourne ? I don’t get it. If you’re sick, please stay home. If not, why can I go the entire show without clearing/coughing but the crew near me can’t. It never stops at this place. It’s usually not bothersome until quieter passages at which time it can drive you nuts if it’s near you. Hmm, it’s not too bad in Melbourne. Sydney Opera House has throat lozenges readily available, as does London’s Royal Opera House. Maybe the Met has too many patrons for that! Perhaps there is a type of New Yorker who likes people around them to know they are sick and suffering. Unfortunately, the sound travels so easily with people talking nearby you can glare at them but coughing etc can come from further away. And winter is only half way through so there may be more coughs to come yet! Hope it eases off a bit for Le Comte Ory. You must see that one. Juan Diego Florez is my absolute favourite tenor and I am very sorry to have never seen him live yet. The costumes are very glamorous and there are two beautiful females roles. I intend to see La Rodine again and also will see LCO as well. Though I’m most looking forward to Rigoletto at the end of the month. Wow you are so lucky to be able to go to all these operas! Interesting link – thanks. As well as all those cancellations, Angela was being interviewed by Renee Fleming during the LIVE screening of La Rondine and just walked off in the middle of the interview saying, very abruptly, she had to rest her voice. On the other hand, I met Angela in Vienna last February and she was very lovely, although she was quick to say she would not come to Australia – because it is too far away! From the Met’s point of view I can totally understand why they cannot abide singers who cancel as I am one of the patrons who complains strongly when the advertised singer is not there. I saw La Rodine again last night. I liked it again. It does not seem to be very popular though. Amazing to me how many left after the first act. I don’t know what went on higher up though, I was in the orchestra. I like when people leave though. More space and no one to obstruct your view. This show has quite a few quiet passages and the throat clearing/coughing was in full swing last night. So I am in agreement with the NYT, which is rare. Alas, The Met won’t be showing it during their HD broadcast. How incredible that people would leave at interval during La Rondine! No appreciation! You are so lucky to have seen it again. Looks like you are onto the birth of a new star there with Kristine Opolais. Hope I will be able to see her next season in something. Sounds like they have big plans for her future. With Australia being so far behind the times, I just saw Un Ballo in Maschera in the cinema this week. Really liked all the leads but thought the sets were rather plain. Their previous production was more spectacular but was clearly getting past its use by date when I saw it in December 2007. Next up is Aida, which I own on blu ray from the last time they filmed this new production but I may go to see it again as it is a bit of a favourite. That is pretty much my sense of what many watching it here thought but I personally liked both. There is nothing behind the times in Australia about running a big time tennis event. I wish I were camped out at Melbourne Park for the next 2 weeks. Saw War Horse in Melbourne last night. I agreed with your review with one exception. Cody Fern’s performance was one dimensional, mono tonal and therefore the drama was diminished. Why he was given this important role is a mystery. Thanks for your comment and glad you enjoyed the show overall. I have had some other friends and colleagues who didn’t particularly like Cody Fern, eg some commented that his accent wavered. For me, he was an improvement on the guys I have seen play the role in London and New York as they made little impression at all. I guess time will tell whether Mr Fern has an ongoing future as an actor..